In 1979, Alan Guth (now at MIT), proposed the concept of cosmic inflation. He believed that the initial energy of the universe would cause a runaway expansion. Until recently it has been theoretical although mathematically proven that the universe is inflating. A collaborative team after three years has corroborated that a twist in light or ripples in space-time are the first images of gravitational waves from the Big Bang. This would suggest that cosmic inflation is correct. Researchers also significantly agree that this confirms a profound relationship between quantum mechanics and general relativity which has implications for study at the Planck scale, previously thought to be impossible. On 17th March 2014, the Harvard-Smithsonian Center for Astrophysics announced that the BICEP2 facility at the South Pole discovered this compelling evidence for quantized gravity and cosmic inflation. 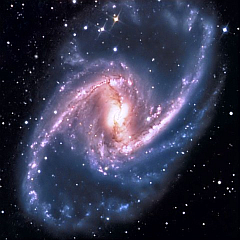 They used microwave telescopes, which enabled sensitive measurements of the cosmic microwave background (CMB),since the air is most like space, thin and dry, at the pole. Working with the light of the CMB, it was found to be polarized and thus scattered by atomic particles. Gravitational waves squeeze space and create distinctive patterns and thus when looking for this signature in the cosmic wave background, a twist in the light was found. This twist is considered to be a ripple in space-time and a sign that the expansion took place faster than the speed of light. Inflation is important because it solves two problems : 1) why is the universe fairly homogenous, that is almost in perfect thermal equilibrium and 2) why is it more flat than curved. Inflation tells that that this is because all the regions, in the earliest period of time, were together and associated with the cosmological constant, and the only significant inhomogeneities are the tiny quantum fluctuations in the inflaton (the particle behind inflation). The fact that all particles had some relation to each other further supports the theories of non-locality of quantum physics. The Book of Knowledge: Keys of Enoch® speaks of the cosmological constant as the connection between particles and a key source to the interconnectedness behind creation. It plays down the “big bang” as one chaotic explosion, favoring a more orderly unfoldment. Guth does go on to describe how inflation is associated with the early gravitational pressures of the universe. He states: “Inflationary theory itself is a twist on the conventional Big Bang theory. The shortcoming that inflation is intended to overcome is the basic fact that, although the Big Bang theory is called the Big Bang it is in fact not really a theory of a bang at all; it never was. The conventional Big Bang theory, without inflation, was really only a theory of the aftermath of the Bang…. The basic idea behind inflation is that a repulsive form of gravity caused the universe to expand.